Introduction: Social Contexts in Medicine (SCIM) is an 18-month program that connects medical students, patients, and physicians for a longitudinal learning experience. SCIM was developed for first- and second-year medical students and seeks to supplement students’ biomedical education with practical experiences built around community and continuity. The program increases students’ awareness of, and skills to address, social determinants of health via a seminar series, a home visit program, and a mentoring component. Methods: The program begins with a seminar series covering communication skills and the basics of social determinants of health, providing the foundation for successful home visits. Students are then paired with a patient for home visits to learn firsthand about the complex social factors that affect health and illness, patient participation in health care systems, and the doctor-patient relationship. In conjunction with the home visits, students obtain guidance from a physician mentor. Results: The SCIM program has been successful during its first 3 years at our institution. Analysis of changes in student attitudes using Crandall’s Medical Student Attitudes Toward the Underserved survey has shown that SCIM students develop more positive attitudes toward the underserved than do their peers completing traditional clinic-based preceptorships. Additionally, in student surveys, the average response to the statement “I learned something valuable I would not have otherwise learned in my classes” has been 4.5 out of 5. Discussion: These findings suggest that the SCIM model contributes to medical education by broadening students’ understanding about the influence of social factors on health and disease. Understand and discuss social determinants of health and structural violence—the ways in which societal structures of power, cultural privilege, and unequal distribution of resources all impact patients’ lives and health outcomes. Identify major reasons for why patients may or may not be able to access health care systems or comply with medical advice. Demonstrate an improved ability to interact with patients in a culturally sensitive and thoughtful manner, develop a relationship of mutual trust, and reflect on how their personal beliefs and socialization may affect the ways in which they interact with patients. Describe the basic structures of Medicare and Medicaid (including the populations who are generally eligible and ineligible) and identify local community health initiatives that serve uninsured patients. Identify the different types of allied health professionals available (patient advocates, social workers, etc. ), the services they provide, and how they can influence care. Perform basic health screenings such as taking vitals, blood pressure, and blood glucose. Beyond cultivating greater interest in primary care, medical school curricula must also equip students to socially contextualize patient encounters—that is, to consider the broader socioeconomic, cultural, and logistical factors that affect a patient’s health and health care needs.5,6 There is a significant need for further training in this area, as studies indicate that shortfalls in care more often stem from physicians making contextual errors than biomedical ones.7,8 In order to stimulate greater student interest in care for the underserved and to provide further training in social contextualization skills, the Social Contexts in Medicine (SCIM) program was started by a group of students at the Tulane University School of Medicine in 2013. The SCIM program revolves around connecting student participants with a patient for home visits over the course of a year. We believe that taking students out of hospitals and placing them in patient homes and communities gives them a deeper understanding of the impact social factors can have on a person’s well-being. Through this program, we hope to facilitate a shift in perspectives and the acquisition of increased cultural competencies that allow students to address the social contexts of care in ways that benefit the student, patient, family, and community. The SCIM curriculum has been refined over the 3 years of its implementation based on feedback from student participants and observations by program leaders. This resource is geared towards medical students, residents, or faculty interested in establishing an SCIM program and includes all necessary logistical information and documents. The program should ideally be implemented as a collaboration between a group of student leaders who handle logistical and curriculum-based tasks, a faculty advisor who oversees the program, and several resident or faculty physician mentors who lead seminars and mentorship sessions. Student leaders should have a basic understanding of social determinants of health,9-13 and the faculty advisor should be experienced in caring for vulnerable populations and have a broad knowledge of health care and community resources. At our institution, the SCIM program is incorporated as an optional, application-based component of the foundational clinical skills curriculum. The target audience members for the SCIM program are first-year medical students, who are selected to participate in SCIM via application prior to their first year of medical school. Students are not required to have prior knowledge about social determinants of health to participate because the program is designed to introduce students to these topics and encourage their future learning in this area. Ideal candidates possess an interest in learning about social determinants of health; enthusiasm for creating a long-term relationship with a patient, including assisting the patient with access to health care and community services; and a level of maturity, organization, and commitment sufficient to complete all aspects of the program over the course of 18 months. The educational approach for SCIM has three main components: (1) seminars for all student participants touching on social determinants of health and other relevant issues; (2) student participation in home visits with a patient for health discussion, screening, and education; and (3) periodic group meetings of students with a physician mentor to reflect upon their experiences. We chose this three-pronged educational approach in order to provide students with a foundational fund of knowledge (the seminar series), active learning and participatory experience (the home visits), and ongoing support and guidance (the mentorship program). Each aspect of the program is addressed in detail in individual Appendices. Appendix A describes the structure of the seminar series and tips for recruiting speakers and creating lesson plans. It also includes a list of the required yearly meetings and suggested topics for seminars with corresponding learning objectives. Appendix B provides an overview of the home visit objectives for students and patients and includes suggestions for patient recruitment, safety measures, and specific tasks for each home visit. Appendix C delineates the goals of mentorship and describes topics that mentors should cover in mentorship sessions. We recommend that implementers familiarize themselves with these three foundational Appendices prior to executing the program. Structurally, the SCIM program is organized into overlapping 18-month cycles (see the Figure) that correspond to the experience of each class year of student participants. Appendix D includes a detailed monthly time line of required tasks, roles, responsibilities, and events needed to create and execute SCIM. During the first year of the program, the structure is slightly different; more information on the first-year structure can also be found in Appendix D.
Figure. The 18-month Social Contexts in Medicine cycle. Student accept and reject emails. Creating an SCIM website or email address. Planning document for introductory meeting. Home visit instructions and safety. The six-part seminar series runs from September to December, concluding with a seminar on motivational interviewing techniques. In January, or the second semester of the MS1 year, student participants begin their home visits with patients. They complete a minimum of four home visits and attend three mentorship sessions with their physician mentor. The students’ home visits and mentorship meetings should ideally be alternated, allowing opportunities for students to discuss and process their home visit experiences. We informally assess individual student progress with a reflection exercise following each home visit (Appendix B) and ungraded presentations by student pairs about their patient after the first semester of home visits (Appendix A). Additionally, we use a standardized patient (SP) encounter to assess SCIM participants’ social contextualization skills relative to their non-SCIM peers. This is discussed in more detail under Monitoring and Evaluation below, and the documents needed for the SP session are included in Appendix G.
Over the summer between the MS1 year and the MS2 year, students remain in contact with their patient either by completing home visits or by calling the patient monthly. During the fall semester, the student participants (now MS2s) must complete three home visits and attend at least two required seminars, in which they assist the new MS1 student participants. They then attend one home visit with the MS1 student participants, after which their 18-month cycle is complete. Each patient participates in the program for a full calendar year, from January through December, and may decide at that point whether to continue in the program for an additional year. Home visits and mentorship evaluation form. SCIM is a relatively inexpensive program to run and does not require many resources above those already available at most medical schools. Necessary administrative materials include access to a printer (for seminar handouts, student instructions, etc.) and the ability to create a website or email address (Appendix E). For the seminar series, general audiovisual equipment such as a projector and laptop are required for speakers who use PowerPoint presentations. Other materials may be required if requested by seminar speakers. For the clinical skills workshop (in which students are taught measurement of vital signs), each student requires a stethoscope, and each student pair needs a blood pressure cuff. These materials may be borrowed or purchased. The home visits require small health-monitoring kits that student pairs must bring to each visit. Descriptions and costs of all these items are listed in the Table. We evaluate the SCIM program’s effects on student participants in order to inform and guide program improvements over time and assess the impact of the program on student attitudes and competencies. We do this with three different approaches and include two out of the three evaluation tools as Appendices should you choose to conduct evaluation and research on the SCIM program at your institution. Biannual student surveys: We send out surveys to student participants in order to measure whether students are enjoying their experience in the SCIM program. This provides a means for participants to give feedback that helps to identify the strengths and weaknesses of the program and guide any necessary changes. Following the final seminar of the fall semester, students receive a link to an online version or a paper copy of the seminar series evaluation (Appendix H). The seminar evaluation form elicits student opinions about the content and relevance of each seminar, as well as generally whether the students enjoyed it. It also asks about the strengths and weaknesses of each speaker and for suggestions on other topics that students would like covered. Similarly, at the end of the spring semester, students receive the home visit and mentorship evaluation form (Appendix H). This form elicits responses about the degree to which students learned about social determinants and their patient’s medical conditions through the home visits. It also asks whether students felt adequately supported, in terms of both safety and guidance, when completing the home visits. Other inquiries to participants regarding home visit safety or other feedback can be sent out at any time. Pre-/postsurvey comparison of student attitudes: We obtained permission from Dr. Sonia Crandall and colleagues to use two subsets of questions from their validated and widely used Medical Student Attitudes Toward the Underserved (MSATU) survey2 to track any effects of the SCIM program on student attitudes and opinions. Due to the total length of the survey tool, we obtained permission from the authors to use only the first two sections of the survey, which evaluate students’ general societal expectations and sense of professional responsibility towards underserved populations. All questions in our shortened version of the MSATU are rated on a 5-point Likert scale (1 = Strongly Disagree, 5 = Strongly Agree). Student responses to questions are averaged for each question subset regarding societal expectations and professional responsibility and are also averaged into a single aggregate attitude score. We asked all students in each class year to take the shortened survey three times for a pre-/postsurvey comparison to assess any differences in attitudes of SCIM student participants (intervention) versus the students who complete the standard preceptorship component of the required clinical skills course (control). For our baseline measurement, we contacted the entire class through the school’s email Listserv at the beginning of the first year. We then contacted the entire class at the end of the students’ first year and at the end of their second year in order to measure both short-term and long-term student attitudes. Survey data were analyzed using independent-samples Mann-Whitney U tests via SPSS software. If you are interested in utilizing the MSATU survey created by Dr. Crandall, we encourage you to contact her directly. Should you choose to utilize another survey for assessment, the Association of American Medical College’s 2015 publication on evaluation of cultural competence education programs14 contains an inventory of major surveys and other evaluation tools utilized in recent studies that would be an excellent resource to start with. Creating your own survey is another alternative. SP encounter comparison: We use an SP encounter to assess whether or not SCIM participants possess greater social contextualization skills than their non-SCIM peers, based on their exposure and experiences. We chose to use an SP case due to both the ubiquity and the utility of the approach.15 All students in our medical school participate in didactic sessions with SPs for both training and evaluation throughout their first and second years as part of the required clinical skills course. We added social contextualization cues to an existing SP case on taking a thorough history from a patient and providing basic, level-appropriate counseling. Adding to an existing case helped reduce the cost and implementation challenges of adding a new session to the clinical skills curriculum, as well as ensuring that all MS1 students would participate, whether in the SCIM program or not. Appendix G includes all of the components needed to run the SP case, which should take 20 minutes per student. The various components of the SP session we use are provided with permission from the Tulane University Training and Assessment of Professional Skills Department’s SP program. Within our curriculum, the SP case is implemented midway through the students’ first year, but we recommend modifying or adding a case that is scheduled to occur closer to the end of the MS1 year, if possible. If your institution does not have an existing SP curriculum or funding that might allow for SPs to be hired expressly to implement this SP case, an alternative is to have physician mentors act as the SPs. A mentor would play the role of the patient, grade the students’ performance, and provide feedback. While this would not allow for comparison between SCIM and non-SCIM students, it still provides the opportunity to evaluate SCIM student participants and give them practice in this area. Furthermore, the feedback and dialogue following the session with the physician mentor acting as SP might be stronger than with paid SPs in a more formalized setting. From 2013 through 2015, the SCIM program has enrolled a total of 23 patients and 58 students and has been well received by both parties. In addition, we have seen some improvement in student attitudes and performance in comparison with their non-SCIM peers. While we have not conducted formal exit interviews with patient participants, students have formed close ties with their patients and commonly discuss during debriefing sessions the emotional support they have provided patients. Additionally, though patients are required to participate for only 1 year, many patients choose to continue for an additional year, and eight patients have continued for 3 years. We plan to begin assessing patient satisfaction with the program more rigorously in the near future. Due to the evolving nature of the SCIM program over the 3 years of implementation and the 18-month cycle, we report data only from participants in the most recent iteration of each component of the program as of the date of submission: the 2015-2016 cohort for the seminar series and the 2014-2015 cohort for the home visits, mentoring, and SP encounter. However, measurement for student safety (new in 2015) came from an email to 2015-2016 participants after having completed only their first home visit. Seminar series: Survey responses regarding the seminar series were collected from 19 of the 20 total student participants in our most recent (2015-2016) SCIM cohort. The average response to the statement “I learned something valuable I would not have otherwise learned in my classes” was 4.5 out of 5. Select responses to the open-ended portion of the seminar survey demonstrate overall satisfaction with the seminars. Mentoring: In response to the question “What do you think we can improve on?” students most commonly mentioned mentoring. Students wanted both more contact with mentors and to be able to do more to mentor their patients (rather than simply interviewing them about their health difficulties). Survey data collected for the first 3 years indicate that over time, SCIM student participants have more positive attitudes toward the underserved than their non-SCIM peers in the traditional preceptorship model within the foundational clinical skills curriculum. For the 2014-2015 cohort, we found no statistically significant difference in scores between SCIM and non-SCIM students at baseline, either in aggregate or for either of the two question subsets. We interpret this to mean that SCIM student participants are not more inclined to have positive attitudes towards the underserved at baseline than their peers. When examining student attitudes 1 year later, we found there was a statistically significant difference in the aggregate attitude of the SCIM student participants (M = 49.4) versus controls (M = 30.5)—Mann-Whitney U = 232.0, p = .024, r = .29. Therefore, preliminary analysis of data collected in our SCIM program’s first years indicates that over time, SCIM student participants develop more positive attitudes toward the underserved than do their peers. Data from the 2015-2016 cohort, with the slightly modified schedule of seminars and home visits, are not yet available. Preliminary analysis of data from the second year of the program (2014-2015), utilizing Mann-Whitney U independent-samples testing to assess for differences in total SP case scores between SCIM and non-SCIM participants, did not demonstrate any difference in total scores between groups. Some reasons for this may be the small sample size for SCIM versus the non-SCIM control and the difficulties recruiting sufficient numbers of patients to the program in the first 2 years, which meant SCIM participants went on only one or two home visits prior to the SP evaluation. Further exploration of the data to assess for variance in scores relating specifically to each of the social contextualization cues in the case may reveal a difference in performance between groups. Statistical analysis is ongoing at this time. We expect that the results of the 2015-2016 cohort, with the new incorporation of motivational interviewing techniques into the seminar series and a later planned date for the SP evaluation, might show that SCIM students’ contextualization skills are greater than their peers by the end of the year. The SCIM program has evolved significantly during its first 3 years at our institution. After retaining successful aspects and reworking the less successful components, we present the most recent version for dissemination. The lessons learned and ideas for continued improvement below should help others continue to optimize the program. SCIM was initially structured as a 2-year program offered to a subset of students through our institution’s clinical skills course, called Foundations in Medicine. 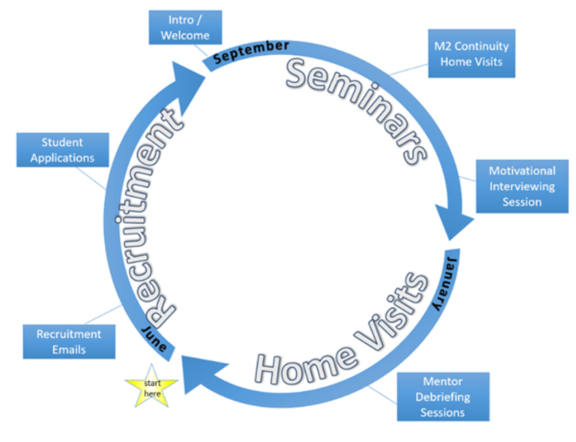 SCIM initially offered the seminar series and home visits concurrently, with both seminars and home visits interspersed throughout the first and second years. In its first iteration, SCIM asked all physicians who recruited patients (usually those for whom they were the primary care provider) to serve as mentors to students, so that students could meet periodically with their patient’s primary care physician to discuss the patient and their progress and work with them to help the patient navigate health care challenges. While most aspects of the program worked well, student feedback and SCIM student leadership identified a few areas for improvement. Mentorship: We found that the physicians recruiting patients were frequently unable to meet one-on-one with students on a regular basis, in large part due to their many other responsibilities as clinical faculty. In order to meet students’ mentorship needs, we transitioned to a group-mentorship model, asking any interested residents and faculty to volunteer to serve as physician mentors. In this new model, two student pairs meet periodically with their assigned physician mentor (not necessarily the physician who recruited the patient) to discuss general challenges and considerations that come up on their home visits. Student participant impact: After participating in SCIM, students reported a desire to be able to do more to help their patients (rather than simply interviewing them about their health difficulties). We identified local organizations and resources that allowed us to provide students with more structured ways to discuss behavior change with patients, counsel patients on preventive health, and connect patients to local resources, as needed. For example, we partnered with the local chapter of a national organization, Primary Care Progress (PCP), and it agreed to sponsor the SCIM program at Tulane, providing funding for the purchase of program materials. This partnership also enabled us to incorporate aspects of the PCP primary care elective, such as the motivational interviewing seminar session. This session was added in the third year of implementation after requests from former SCIM members. We also partnered with our institution’s internal medicine-primary care track residents, who were involved with the PCP chapter, and some of these residents have volunteered to be SCIM mentors. SCIM organization: After the first year, SCIM student leadership decided to change the concurrent timing of the seminars and home visits to a more logical model in which basic information (seminars) was presented prior to students going on their first visits with patients. The seminar series now occurs entirely during the fall semester. This provides basic social determinants of health information and theoretical frameworks for approaching patient issues that help prepare MS1 students for their home visits with patients. We request that presenters include examples of their experiences with patients locally, so that students can better understand the particular challenges patients are likely to face and feel more comfortable addressing them. We have found the recent changes made to be largely successful, based on feedback from current student leaders and program participants. Moving the seminar series to the fall made the sessions closer together, allowing students to draw more connections between seminars. Students appreciated the local focus of the seminar series and the presenters’ personal anecdotes. The motivational interviewing seminar was well received; students found it to be useful and enjoyable and expressed that they wanted more opportunities to practice motivational interviewing. The seminar met our goal as an introduction to a very important topic that can be further explored in mentorship sessions. The more robust mentorship model in the spring semester allows students to revisit information from these seminars as well as process their experiences. We are constantly working to assess the effectiveness of the SCIM program and to improve the experiences of students, patients, and physician mentors. In addition to the changes already mentioned, we note below some opportunities for continued improvement based on student feedback and our own reflections relating to the current version of the curriculum. Adding a written test to be given prior to the start of the program and after each of the three semesters of the program. This will establish each student’s baseline of knowledge and assess his or her progress towards achieving Educational Objectives 1, 2, 4, and 5. Creating a structured grading sheet that faculty facilitators will use to evaluate the student pairs’ patient presentations. We hope to add a second presentation, given by MS2s at the end of their final semester in the program, to further assess mastery of Educational Objectives 1-3. Compiling the reflection exercises that students complete following each home visit for SCIM student leaders and the faculty advisors to review once per semester and provide each student with feedback. Reviewing the results of the SP exercise to assess each student’s individual performance, rather than analyzing SCIM students’ performance only as a group. We may also add measurement of patient vital signs to the exercise, to assess student attainment of Educational Objective 6. We encourage institutions adopting the SCIM program to consider these and additional ways to assess student progress within the program. Keep in mind that these methods should be appropriate for an elective course and not overly burdensome to student participants or faculty. Curricular integration: We hope to integrate parts, if not all, of the SCIM curriculum into the preclinical medical school curriculum. A particular goal would be to have the introductory lectures on social determinants of health be required lectures within the foundational clinical skills curriculum so that all students would be exposed to this information. Increasing the size of the SCIM program will allow a higher percentage of medical students to receive this hands-on, patient-centered education on the social contexts of care. Ideally, we would eventually transform SCIM from an elective program in which interested students self-select to participate into a required home visit–based experience to which all students are exposed. Patient participant evaluation: Currently, we have anecdotal information from students in the program about successes with patients but do not have information directly from patients about whether SCIM helped them, whether they enjoyed it, and what suggestions they have to make it more beneficial for them. We plan to create a more robust and formal structure through which to assess patients’ experiences in the program, through qualitative surveys and/or health outcomes data tracking. Partnerships: We have already taken steps to create partnerships with other programs dedicated to improving care for marginalized populations and plan to continue to strengthen them. One future partnership may be with the local AAMC Hotspotting initiative. In the future, our students may be able to shadow patients who have completed the Hotspotting program to provide a few more months of close follow-up for these high-risk, high-utilizing patients. This would be ideal for students who have completed a year of SCIM and can serve as particularly effective patient advocates within the Hotspotting program during their MS2 year. This may also provide a greater pool of patient participants for the continued expansion of the SCIM program. Interprofessional SCIM: The concepts taught within the SCIM curriculum are applicable to other disciplines (e.g., nursing, physician assistant training, dentistry, optometry, pharmacy, etc.). This curriculum could be easily adapted to fit the educational models of many other health care fields. We welcome and encourage interdisciplinary SCIM groups as well. We would like to acknowledge the students, faculty, and residents whose contributions have made the Social Contexts in Medicine program a success at our institution. We extend special thanks to Sienna Kurland, Sam Huo, and Camille Bourgeois at Tulane, who instituted several valuable and substantial improvements to the program during their year as student leaders. Social determinants of health. Healthy People Web site. https://www.healthypeople.gov/2020/topics-objectives/topic/social-determinants-of-health. Updated January 27, 2017. Bury M. Health and Illness. Cambridge, England: Polity; 2005:chapter 2. © 2017 Drake et al.